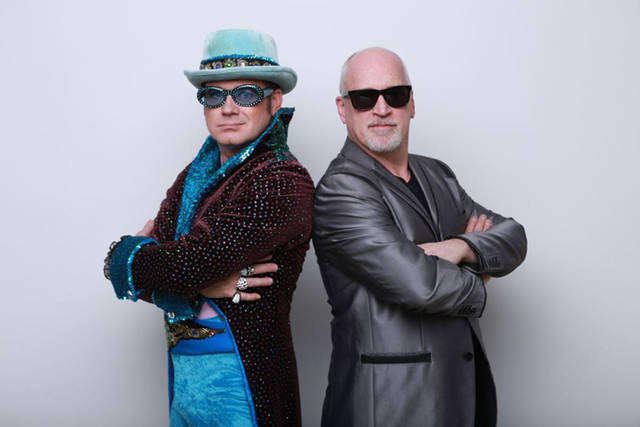 DARKE COUNTY – Darke County Center for the Arts recognized Coppock-Hole Trust as a Spotlight Sponsor of the recent sold out Artists Series performance of Piano Men – A Tribute to Elton John & Billy Joel on March 30 at St. Clair Memorial Hall. “DCCA is grateful for the continued generosity of the Coppock-Hole Trust, which provide opportunities for cultural enrichment in our community,” DCCA Executive Director Andrea Jordan said. The Coppock-Hole Trust has been a sponsor of DCCA programs for more than 30 years as well as supporting the preservation of the Henry St. Clair Memorial Hall as an important cultural center. “Piano Men” also was sponsored by Greenville National Bank and The Advocate & The Early Bird Newspaper. The Ohio Arts Council helps fund this program with state tax dollars to encourage economic growth, educational excellence and cultural enrichment for all Ohioans. Joan Ellison will sing Judy Garland with the Toledo Symphony on May 11 for the final Artists Series performance of DCCA’s 2018-19 Ruby Celebration Season. Featuring Garland’s original arrangements brought back to life, guests will hear her biggest hits from Hollywood to the concert stage, including “The Trolley Song,” “Zing! Went the Strings of My Heart,” “That’s Entertainment,” “Get Happy,” “The Man That Got Away” and, of course, “Over the Rainbow.” Tickets are $35 and available now online and through the DCCA Office. DCCA presents and promotes performing and fine arts encouraging cultural enrichment. For more information on DCCA the 2018-19 Ruby Celebration Season, contact the DCCA office at 937-547-0908 or visit its website at DarkeCountyArts.org.